In 1929 Edwin Hubble discovered that our Universe is expanding. Eighty years later, the Space Telescope which bears his name is being used to study an even more surprising phenomenon, that the expansion is quickening. The origin of this effect is not known, but is broadly attributed to a type of “dark energy” first posited to exist by Albert Einstein and now dominating the mass-energy budget of the Universe. The author will describe how his team first discovered the acceleration of the Universe and why understanding the nature of dark energy presents one of the greatest remaining challenges in astrophysics and cosmology. ADAM GUY RIESS is an astrophysicist at Johns Hopkins University. He leads the Higher-Z SN Search program, which uses the Hubble Space Telescope to discover distant supernovae. This program has studied the expansion of the universe over 10 billion years ago. This work has detected an early phase of decelerating expansion, causing the most distant supernovae to look relatively brighter. This tends to confirm the dark energy – dark matter model. 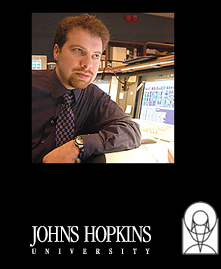 Before coming to Johns Hopkins in 2005, he had been at the Space Telescope Science Institute. Earlier, he was a Miller Fellow at the University of California at Berkeley. In 1998, he led the study for the High-Z Supernova Search Team which first reported evidence that the universe’s expansion rate is accelerating. This result was also found by the Supernova Cosmology Project. Science Magazine named the discovery of the accelerating universe the 1998 “Breakthrough of the Year.” In 1999, Adam Riess received the Trumpler Award from the Astronomical Society of the Pacific. He received the Bok Prize from Harvard University in 2001. The American Astronomical Society awarded him the Helen B. Warner Prize in 2003 and the Raymond and Beverly Sackler Prize in 2004. In 2006, the American Astronomical Society awarded the $1 million Shaw Prize in Astronomy for the discovery of cosmic acceleration, in which he shared. He and the other members of the High-Z team and the Supernova Cosmology Project also shared the $500,000 Gruber Cosmology Prize in 2007. Adam Riess was awarded a Macarthur “Genius” Grant in 2008. He is a member of the National Academy of Sciences. He received his bachelor’s degree from MIT in 1992 and his Ph.D. from Harvard in 1996. President Larry Millstein called the 2,261st meeting to order at 8:16 pm December 4, 2009 in the Powell Auditorium of the Cosmos Club. The minutes of the 2,260th meeting were read and approved. Mr. Riess began by saying the large crowd was because he was going to give out samples of dark matter. He showed a picture of deep space taken by the Hubble Space Telescope. It is a very busy picture, full of lighted objects. It is, Mr. Riess said, the deepest image ever taken with the Hubble and contains thousands of galaxies. To get the shot, they kept the aperture open 11 days. They had to hold it really steady. Some of the objects in the picture placed photons on the photo plane at one photon a minute. The objects look static, but they are not. If we took the picture again, it would look the same, but analysis reveals the space between the galaxies is expanding. How do we know that? We checked, he said. How do they check? Mile markers work well, but alas, there are none in space. Standard candles could work, and space does have an analogue for them. Foghorns could work, and there is sort of an analogue for them. Apparent size of an object could help, if you knew the size. One of these ideas actually works well. It is the standard candle idea. Certain supernovae, Type 1a, have a known brightness, so their apparent brightness, which is reduced by the inverse of the square of their distance, indicates their distance. Subrahmanvan Chandrasekhar showed that the dense matter of a white dwarf is not stable at more than 1.4 times the mass of our sun. When there is a white dwarf in a binary system with a lighter star, the lighter star gradually bleeds matter into it. When it reaches 1.4 times the mass of our sun, it goes into a violent thermonuclear explosion and burns as bright as four billion suns. That is the cosmological standard candle, the Type 1a supernova. Another useful phenomenon is the redshift. The redshift reveals recession. Candles emit light with certain wave lengths. The farther away they are, the faster they are receding. Thus, the farther away they are, the greater the redshift. This is somewhat like the Doppler shift with an apparent velocity, but a different origin. Using the apparent brightness to measure distance of supernovae and the redshift to indicate the expansion of space at different distances, the rate of expansion of the universe today can be calculated. The Hubble constant is the proportionality between the distance to an object and its speed. Mr. Riess showed some pictures of Einstein visiting Hubble at work at Mt. Wilson. One of the pictures showed Einstein looking into the scope, which, actually, they did not do. Even then, there were contrived publicity pictures. Mr. Riess set out to measure how fast the expansion is slowing. He said he needed an expansionometer, a device with a needle and some numbers representing expansion. Unfortunately, he did not have one. Fifteen years ago, the assumption was that we lived in a dense, heavy universe, and thatit would stop expanding and start contracting. What they expected to find out was how much it was decelerating. The rate at which it was slowing would indicate the mass of the Universe. They needed to find a good number of Type 1a supernovae. Finding them was easy for us; we saw big arrows pointing to them in the pictures. It is harder before they put the arrows on. The rate of supernovae is about one in a galaxy in 100 years. Therefore, they look at many. Using a wide angle lens, a good telescope, and a computer, they can find many, and they did. Supernovae last about 100 days, so there is a good opportunity to take measurements once they are spotted. He wrote a computer program to use the data to determine the mass of the Universe. The answer was negative mass. This problem was that he had assumed the expansion was slowing, but it was accelerating. He showed pages of his notebook and a string of emails as this discovery took hold of the group working with him. Doubt, wonder, and excitement were all in evidence. Why is it expanding? We don’t know. Einstein’s concept of repulsive gravity, the cosmological constant, could explain it. Mr. Riess invoked a concept he calls dynamical dark energy, an energy field that pervades space. Another possibility is that Einstein’s theory of gravity may have a subtle error embedded in it. Another possibility is measurement error, such as dust in space making distant supernovae dim, or possibly for some unknown reason, supernovae were born dimmer a few billion years ago. But it now appears that the universe is expanding 20% faster than it was 5 billion yrs ago. Recent studies using the Hubble’s unique ability to measure Supernovae indicate that dark energy was in the universe nine billion years ago. Why study dark energy? It is now believed to be 70% of the energy-mass of the universe. It is expected to determine the fate or origin of the universe. It touches the central pillars of modern physics, quantum mechanics, general relativity, and string theory. Finally, it is likely to lead to something interesting. Now, it is like blind men observing the elephant; what they observe depends on the position from which they observe. For the future, an upgrade to the Hubble done in May of this year may improve the sight of the blind men. Also, NASA and DOE are planning to build a joint dark energy mission. Several different concepts are being considered. To summarize, he made three observations. We discovered accelreatin expansion and dark energy ten years ago. This has been confirmed since then by even more distant measurements. Undrestanding dark energy lies in the path to understanding gravity and the fate and origin of the universe. Finally, he said we expect to learn more soon from a spate of different measurements, perhaps with help from a space telescope. Finally, he speculated that if Einstein were alive, his words might be, “I told you so,” meaning he told us of the cosmological constant. One person asked, how do you know the Type 1a supernova from other types. By the distribution of elements, Mr. Riess said. The distribution varies, and Type 1a are identified by the ratios of different elements. Another person asked, what if we are in a bubble where physical phenomena appear different? The odds of that are low, he said. The evidence we have runs against it, too. The universe does not look lumpy, and acceleration appears to be the same in all directions of us being in a bubble. He is sticking with the proposition that the laws of physics are the same elsewhere as here. We are not that special. He also observed that there is an interesting coincidence, though. If dark energy is another one or two orders of magnitude, we aren’t here. Speculating, nevertheless, on the question of physical law variations, he said that, if the velocity of light changes, all bets are off. Are galaxies growing, too, someone asked. Yes, he said. All the objects out there are spreading out. In a galaxy, however, matter is pretty dense, and the spread is slower. After the talk, Mr. Millstein presented to Mr. Riess a plaque commemorating the occasion. He welcomed Mr. Riess to membership in the Society. He announced the next meeting and presentation. He made the parking announcement and other housekeeping announcements. Finally, at 9:47 pm, he adjourned the 2,261st meeting to the social hour.